We thank our loyal ladies of 2010 and can’t wait to continue in friendship this year … more sewing, more learning, more talking and more fun. Beginners are most welcome … we would love to get you started If you would like to have a go at English Paper Piecing or Buttonhole Applique email: thequiltfairy@iinet.net.au or some new Machine Piecing projects email: thequiltfairy@iinet.net.au to register your interest. You can try some of our projects or just come for “social sewing” … make new friends and work on your existing projects. We hope to have Charity Quilts on the go this year for you to be part of, if you wish. We will be starting on Feb 5th, 2011. Retreats are in the planning process for May and September. More information will be given soon. You may be interested in our inexpensive, informal ” Sharing our Skills” workshops and demonstrations that will be held at our retreats. 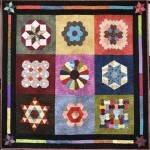 This year, The Quilt Fairy has two sampler quilts for you to try. 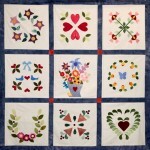 Neither quilts need a large financial outlay to get started. They are both “pay as you sew” … buy the blocks as you need them … you set the pace. “Getting Started” will also be able to supply you with Backing fabrics,Wadding, Rasant Thread and other Sewing Notions. Lavender Quilt Fabrics will be there each Sewing Day to help with your fabric requirements.